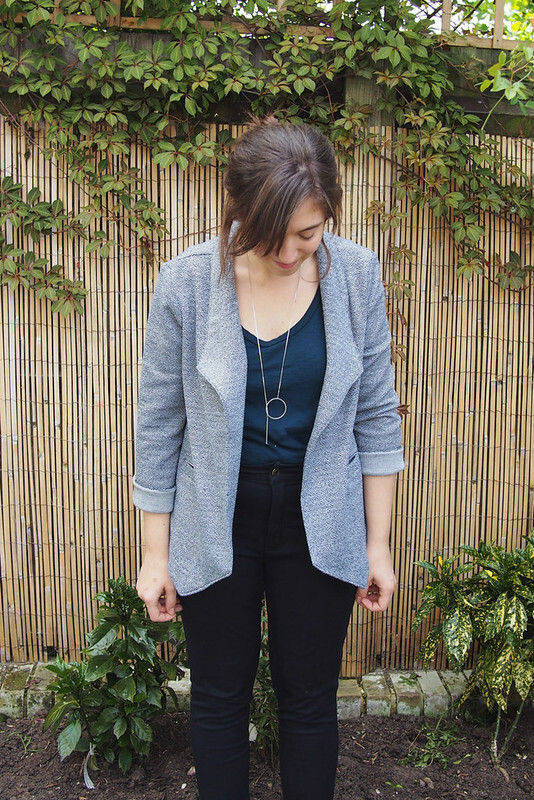 Like quite a lot of others in the sewing world, I’d been awaiting the release of Grainline Studio’s Morris Blazer for quite a while. 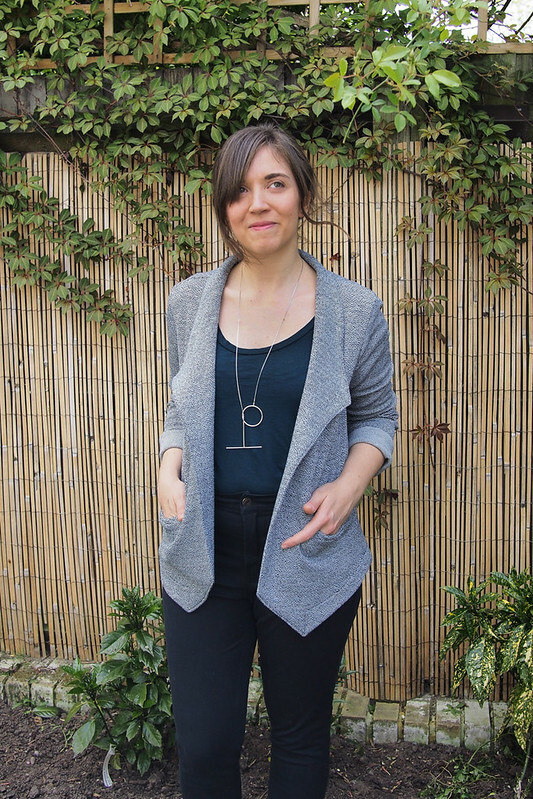 I’ve been desperate to make a knit blazer to replace a very tired old Anthropologie one I wore to death last spring/summer, so it jumped right to the top of my sew-queue. I was going to wait a little bit longer until the printed pattern shipped, but when Gillian pointed out that the PDF is only 28 pages I went for it without wasting any more time! 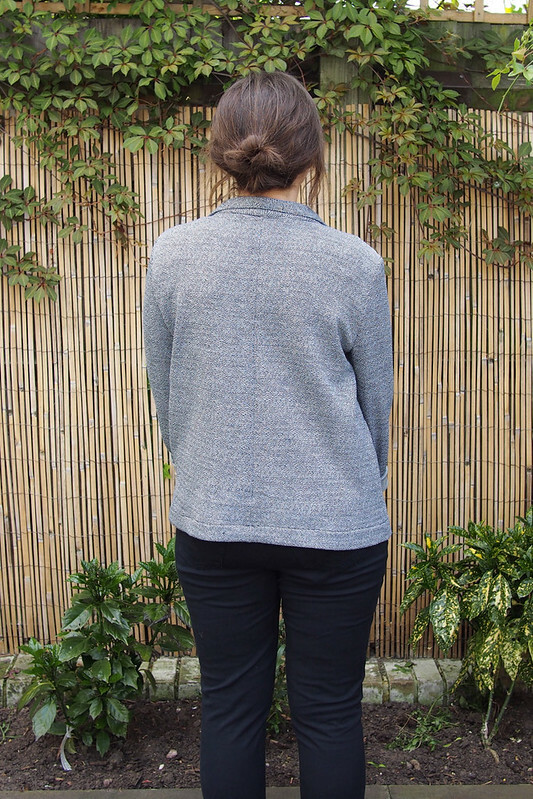 Morris is designed for stable knits or stretch wovens, and I had this fabric ready and waiting – a heathered wool-mix interlock from Cloth House. I didn’t make a toile but did make a few flat adjustments before cutting the fabric. Mainly I wanted to make more of a slouchy boyfriend silhouette rather than the shrunken, cropped shape, so I added 2 inches to the length of both the body and the sleeves using the lengthen/shorten lines. Besides that, I cut a 6 across the shoulders grading to a 10 at the hem. I was a bit worried it still wouldn’t fit around my bum, but actually the fit turned out just how I hoped – swingy and loose, but still with a nice fit around the shoulders. I think the shoulders are a bit wider than they should be but I didn’t want to over-fit it so it’s comfy for cycling. Also the shoulder seams are quite far forward, which I’m not sure is a design feature or a sign I need to do an adjustment. After finishing it, I felt like the larger expanse of front needed to be broken up by some pockets, so I used this tutorial to add some mini ‘cheats’ welts. I say cheat because you just fold up the pocket facing to create the welts rather than have a separate piece, so they’re much less nerve-jangling to install than the traditional method – but quite neat and effective anyway. They’re a bit tiny to actually hold my hands, but at least they hold a phone and/or Oyster card so are a practical addition. Sewing it up was quick and fun. I used a mix of the overlocker and a straight stitch on my normal machine – I don’t think the stitches will pop since it’s not close-fitting. It’s unlined, but I like how all the facing edges are tucked under for a tidy finish inside. I just wish I’d sewn the lapels with the wrong side of the fabric facing out for a bit of contrast: I’d already fused on the interfacing (I found my knit interfacing at Ray Stitch by the way) before I thought of it. Nonetheless I think this is a worthy successor to my old jacket and should get a ton of wear in the coming months. Let’s end on a cat photobomb! It’s a bank holiday Monday here and against all the odds it’s a beautiful day, so I’m going to put the machine down now and take my new Morris for a wander. This blazer is so beautiful on you!! Your pics make me want to make one for myself! Very chic. Very impressed by the welts! Love your little necklace too. And of course the kitties are marvellous. Perfect accessories! Very nice! I like how you lengthened it for something a little more slouchy. Love the fabric you used! Really useful item to have in your wardrobe. Looks good on you, I can see you making another one. Beautiful! 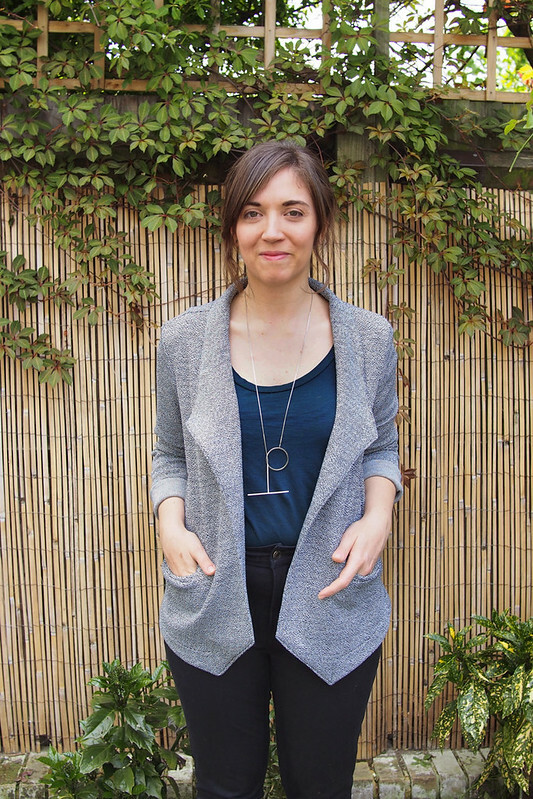 Love the modifications you made – I will probably make a couple of Morris blazers and would love to do a slouchy version like this too. Great work! I love your fabric choice – I think I would also extend the arm length as well. Beautiful Job! I forgot to say the arms on mine are full length with the 2″ I added, but I’ve just rolled them up. I love this! The fabric is perfect, and the changes you made to the fit are really flattering and cool. Looks comfy and chic – what more could you ask for?! Thanks! It’s mega comfy and easy to wear. I love love love your blazer, and it looks fantastic on you! I think this is probably the most convincing version for me yet… I too was waiting for this pattern to come out, but wanted to see several makes before making it myself. I think the longer length would be more flattering on my body – and I love your faux welt pockets too! Yeah I felt if it ended at the high hip it’d make my hips and thighs look huge – I prefer the longer length to skim them! Gosh, Katie, that blazer looks awesome. I don’t think the shoulders look wide at all. I think they contribute to that slouchy boyfriend jacket look and those pockets! Absolutely wonderful blazer! Thanks. Glad the shoulders look good to you. He’s such a scene-stealer isn’t he! I love this! It suits you very well and I love the extra length. An idea to try for next time, the reverse lapel! love your version! The longer length is very appealing, thanks for showing how great it can look. Gorgeous! I am impressed with your skills and imagination. 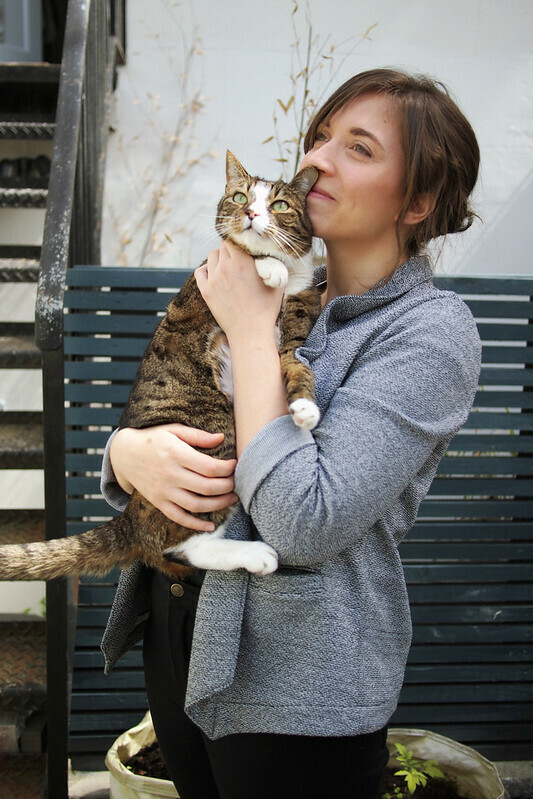 A lovely blazer and two lovely cats!! I think you’ve tipped me over the edge into wanting to make this pattern, yours looks so great. This looks fantastic! I love the changes you made and the cheater welt pockets are great. That fabric is perfect for it too! This is probably my favourite Morris so far! works brilliantly and love your slightly longer length version! Fab blazer and such a handy wardrobe staple. Your cats are beauties. Aren’t they, and such attention seekers! This is such a you jacket! It’s lovely. I may have to get taping with this while my sewing machine baby is in the hospital this week! Your fabric is lovely and I really like the longer length of your version. I made mine with contrast collar and facings and I love it! 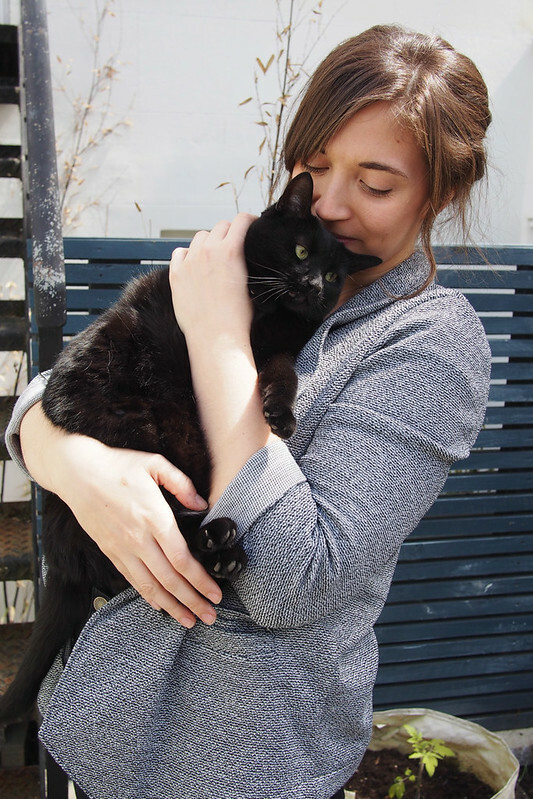 Love that shot of you and your kitty gazing off into the distance!! Love it Katie (love the whole outfit, in fact)! That fabric looks just perfect! I think this is one of my favourite Morris Blazers so far! 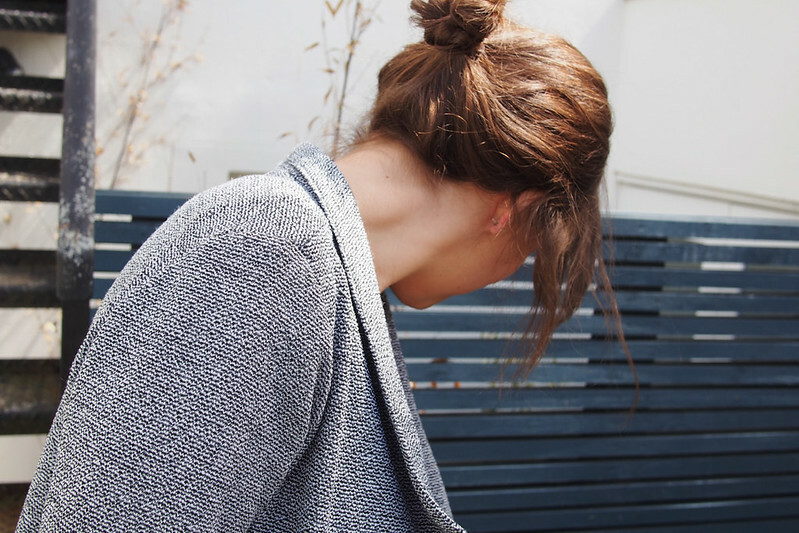 I love the relaxed fit and in that grey marle it is perfection. 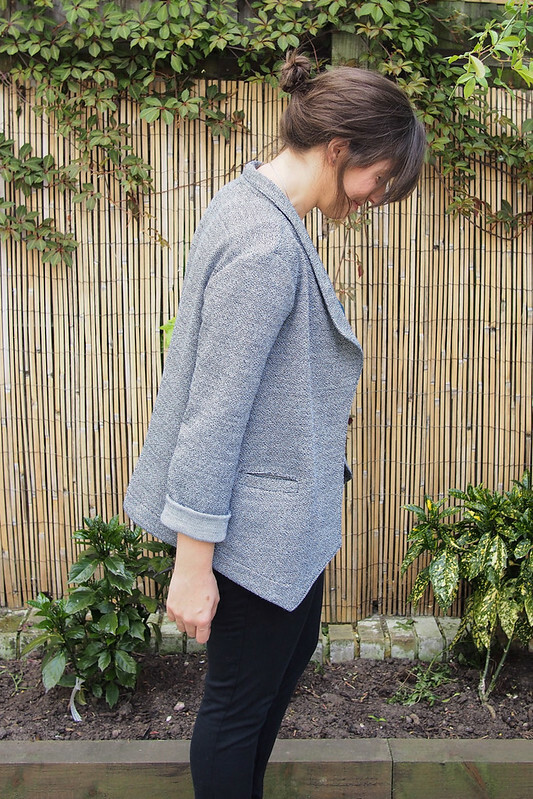 This is a really good looking blazer Katie, you’ve definitely bumped this pattern up from a maybe to a soon! Love the fabric too. As soon as I saw you in my reader, I had wondered if you would change the fit because I couldn’t imagine a tighter shorter version… this looks great and I would love it with black crisp trousers and heels for a summer night out in the UK… you could team it (or I would) with red to make the jacket look super cool. I would have no freaking idea about the knit interfacing shopping… as I’ve had not much luck for normal interfacing here are the fabric markets… it’s too hot for any jackets now though, so Morris might be my autumn sewing project. 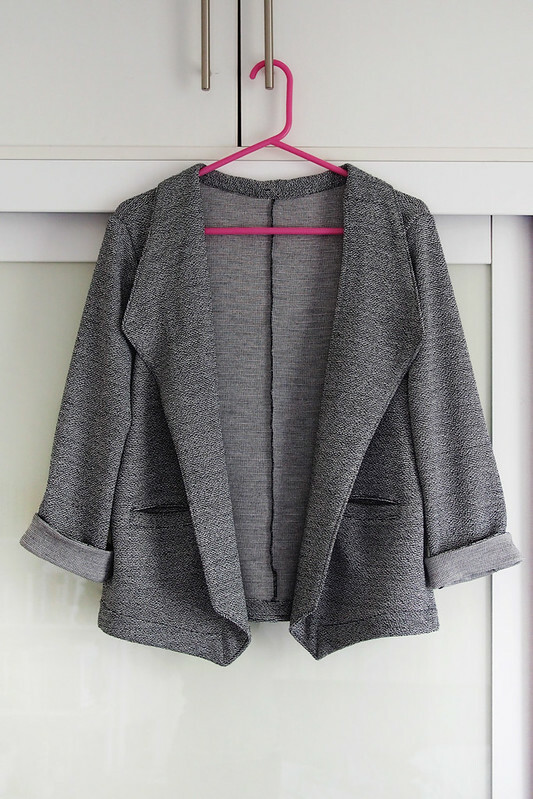 This blazer has a really lovely, interesting and unique shape – love it! Well done Katie. That’s all the super cool pattern. 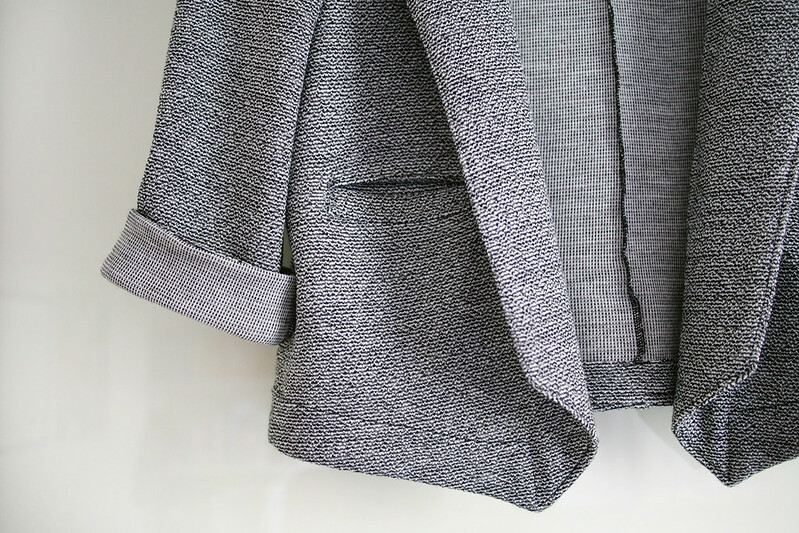 I love how the pointed hem reflects the lapels, so smart. Design feature it is! Look forward to seeing yours! When I saw this pattern I didn’t think it was for me but after seeing your version It makes me want to buy it right away. I loved the style and fabric choice. Glad to hear I changed your mind a bit – sometimes it’s tricky to imagine a few little changes that make a pattern work better for you. Katie! It’s so perfect. I love that fabric, I think it really makes it as opposed to using a plainer ponte. Inspired mods you made too, I’m sure you’ll wear this to death! This is so lovely! I’ve been looking for the perfect blazer pattern, and was hesitant to buy Morris because of the cropped fit. I love love love the effect of lengthening the bodice and sleeves! OMFG. Now I really, really, REALLY need a longer, slouchier Morris! Great idea!!!!! I think this is a perfect blazer. I’ve been unsure up until now cause I didn’t want to make it and feel like it was too small to be warm enough in the gallery. Thanks! Mine is very cosy indeed. Hi Katherine, thank you! I just mean that I cut the pattern in a size 6 across the shoulders and graded out to the lines of the 10 at the hips, both to suit my shape and to make the fit looser at the bottom. Hope that helps! No prob. Just had a look at yours on Instagram – I love the fabric and colour you used! I love your Morris Blazer and it convinced me to buy the pattern. 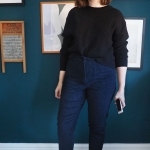 I love the slouchier fit but I am wondering what size to cut! I have traced off the 6 (I am a 35″ busom) but am wondering if the 8 would be better in terms of ‘slouchiness’? I am reluctant to cut into my rather gorgeous fabric until decided! Any advice would be very gratefully received. Hi Elouise – I would not size up too much on the top half because you want a nice fit through the shoulders. so if you measure a 6 I’d cut the 6, but perhaps grade out to an 8 or 10 at the hip. I think it’s mainly adding the extra length that helps with the slouchy fit. Oh thankyou, I will try that, and definitely do a muslin before cutting the expensive fabric! 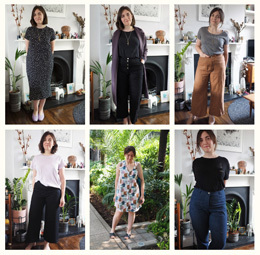 I have to say, I am a follower of your blog and it is your sewing which has inspired me to work on my handmade wardrobe, even though I am most definitely a novice. Keep up the sewing and thankyou for the advice. Nice blazer, I like the length and mostly I love the fabric that you used. I made mine in olive green with leather sleeves. The only thing I didn’t like about the pattern was that is boxy. Love this post, blazer, and your necklace. I was especially interested that you intentionally left the shoulders a bit looser for cycling. Are there any other bicycle considerations you take into account when sewing? 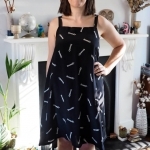 Oh yeah definitely – having plenty of ease in the armsyce area is important, and skirts that are long enough to not fly up but not get tangled either… culottes and jumpsuits are super for cycling too. And natural fibres, always!